Kotobukiya has sent along some new info, price and release date for their upcoming X-Men Danger Room Sessions Colossus Fine Art Statue. A KOTOBUKIYA Japanese import! The amazing X-Men Danger Room Sessions Fine Art Statue series continues with its fifth member, the mighty steel-skinned mutant COLOSSUS! Born Piotr “Peter” Rasputin, the mutant who would become an X-Man grew up on a struggling farm in the Soviet Union. His first comic book appearance took place in 1975’s Giant-Size X-Men #1, when Professor Xavier visited the small farm to recruit Peter. At first denying his powers, the mutant revealed his true abilities when a runaway tractor threatened his sister. Transforming into a living steel form with vast strength and durability, Colossus would join the X-Men and serve with distinction, which of course meant lots of practice in the Danger Room. Ever since the early days of Marvel Comics’ mutant adventures, “X” teams have trained together in the ultra high tech facility known as the Danger Room, equipped with state of the art adaptive combat and athletics routines that challenge each participant in unique ways. The training facility has been featured prominently in X-Men comics over the years, as well as in various cartoons and the third X-Men film. 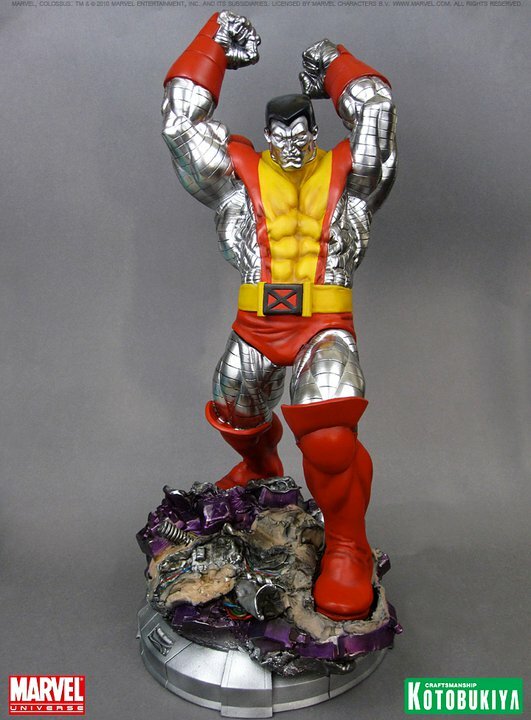 Inspired by Jim Lee’s 1990’s era X-Men, Colossus is a massive and unstoppable force. The massive mutant is posed triumphant on the field of battle, about to bring down his heavy fists to crush the last of his wrecked foes. 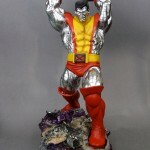 With his powerful physique transformed into living metal, Colossus has a fantastic sculpt showing off each and every muscle wrapped in smooth, narrow bands. He wears his classic bright red and yellow costume that’s decorated at the waist with a large red and black “X” logo. Everywhere his “skin” is exposed is bright metallic silver, except for his black hair, making Colossus very visually dynamic. But that’s not all. You even have two cool options when it comes to displaying the X-Man as he comes with two interchangeable heads: the first is angry yet focused, while the second is a sheer mask of rage! Sculpted by Erick Sosa, the enormous Colossus stands over 15 inches tall! He’s perfectly in scale (1/6th) with the other Danger Room Sessions members, and like them stands upon a unique Danger Room holographic environment with translucent parts that glow with a built-in LED light in the base. In Colossus’ case it’s the shattered remains of a torn up Sentinel robot! That is definitely awesome. I feel Colossus doesn't get the right popularity status that he deserves. If I had any room available for statues, this would be on my want list for sure. Not a fan of the base but the figure is increibdl!